This is the time of year that I enjoy the most. My younger junior deerslayer and I have finished up her homeschool year. My older junior deerslayer turned 24 today. With these milestones under our belts, the entire family has switched into camping mode. We are pulling out camping lists, preparing menus, and beginning to cook and freeze the meals that we will prepare for the annual Deerslayer Clan camping trip to Wyoming. This year we will be staying for two weeks. We’ll be filling propane tanks and cleaning out coolers this weekend. I’ve prepared and frozen 9 dozen wild pork enchiladas. They were frozen in 9 x 13 casserole pans and transferred to gallon freezer bags. 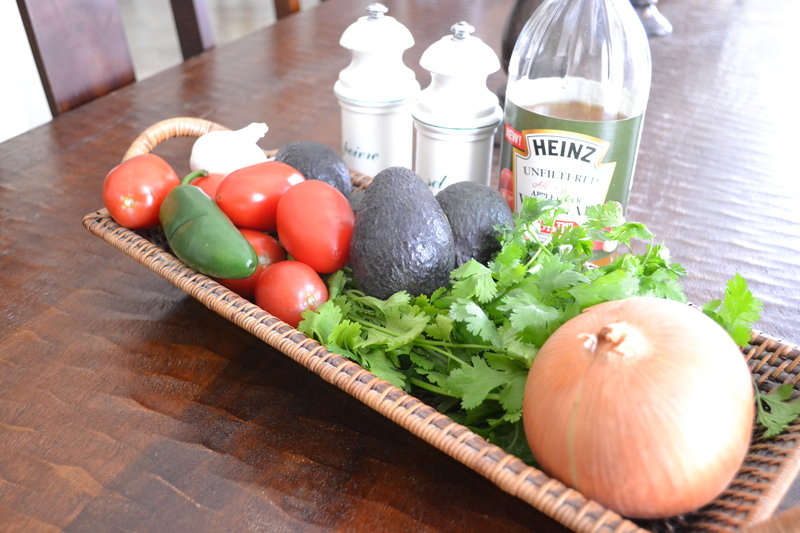 I’ll prepare the gallon of creamy poblano sauce a couple of days before we leave. I’ve also prepared 1 ½ gallons of bean soup and transferred it to gallon bags which I lay flat on a cookie sheet. I’ll be making Mexican Rice for 50 people this weekend. I discovered that parboiled rice doesn’t get sticky and can be reheated in batches with a little broth in a large cast iron skillet and transferred to aluminum trays for serving. Every year, my Deerslayer prepares fajitas for the entire crew. This is no small feat! 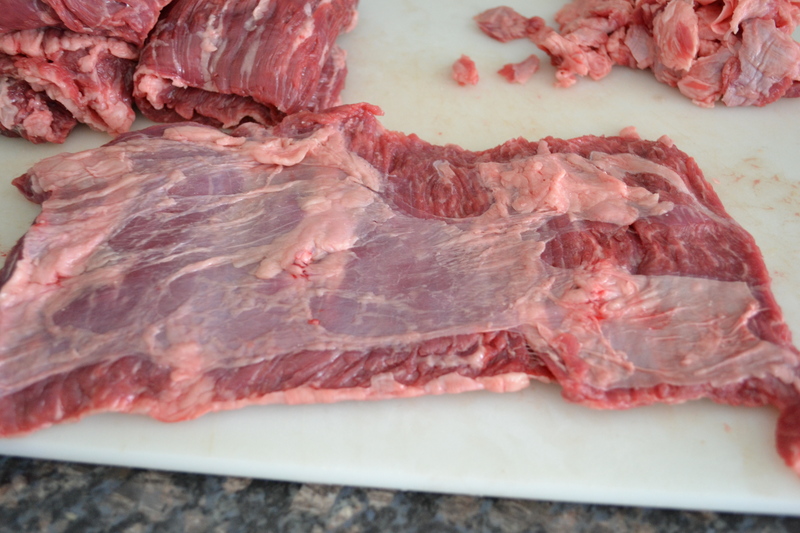 Fajita meat, also called skirt steaks, requires removing skin (usually even the skinless ones). For this reason, until the last 20 years or so, fajita meat was some of the cheapest you could buy in the South, because of the work involved in preparation. With the increased popularity of fajitas nationwide, the cost has continued to rise. Same amount of work, just quadruple the price. Go figure! 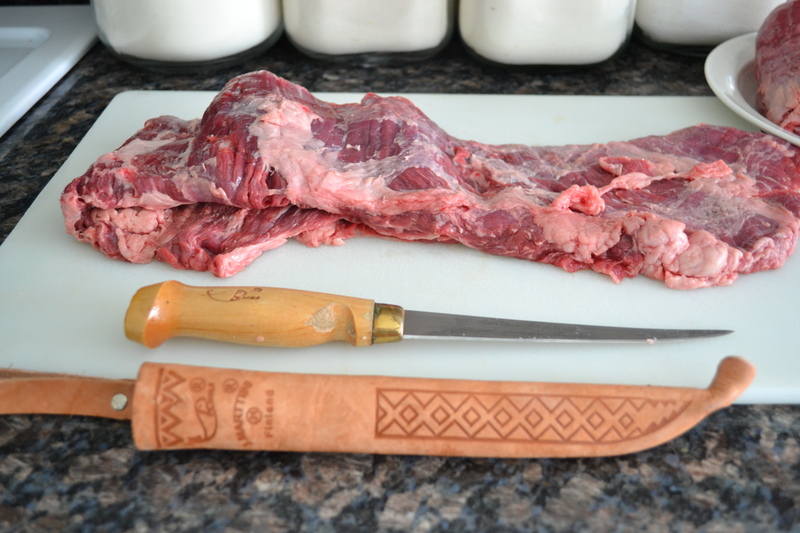 Fajitas, like I mentioned before, require skinning. 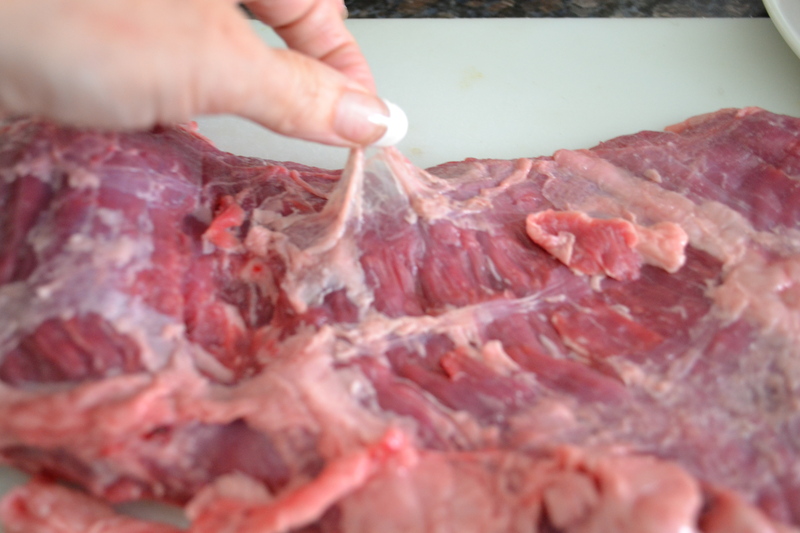 This process is very similar to removing the silver skin or fascia from venison or elk. The skin can rather easily be lifted and removed using a sharp filleting knife. I have my favorite that I bought in the fishing area at Academy Sporting Goods. I keep 2 sizes in the camper and also at home. I really, really like this knife. Its thin blade makes short work of what could become very tedious with a substandard, dull knife. My deerslayer has instilled in me a real appreciation for good cutlery. Last year, I skinned all the fajitas (25 lbs.) at home, packaged them up pretty flat in gallon sized bags so they would thaw easily, and froze them, in the bags on cookie sheets in the freezer. That way they stacked easily with the other food I prepared. Before the frozen foods are packed into the coolers on the day we leave, I place several flat gallon bags into a 2 gallon zip bag. One year, the carne guisada began to thaw once we got up there. The zip bag had split and we had a big mess in the cooler and no carne guisada! It’s at this time of the summer in South Texas that fajitas begin to go on sale, usually around Memorial Day and again near the 4th of July. Some are more flavorful than others. Some require less skinning than others. The Deerslayer family becomes guinea pigs right about now. We purchase fajitas from various grocers and grill them up to see which are the best. Once we’ve come to a consensus on the best flavor for the money, we buy up lots, skin them, package them, and freeze them. The process isn’t really that painful! There are several weeks of great grilled fajitas in preparation for the trip. I give my Deerslayer credit for being “grill-gifted”. He prepares some amazing feasts. Usually, he uses McCormick’s meat marinade, but just for a very short time, since it has papaine, a meat tenderizer in it that will turn good meat to paste if you’re not careful. Even the best fajitas need good tortillas. The packages that are available in the bread section at the local grocer SHOULD NOT be an option. I DO realize that not everyone has access to fresh, hot corn tortillas. There’s nothing to compare to the soft, melt-in-your-mouth fresh corn flavor that can only be attained from fresh hand-made corn tortillas. 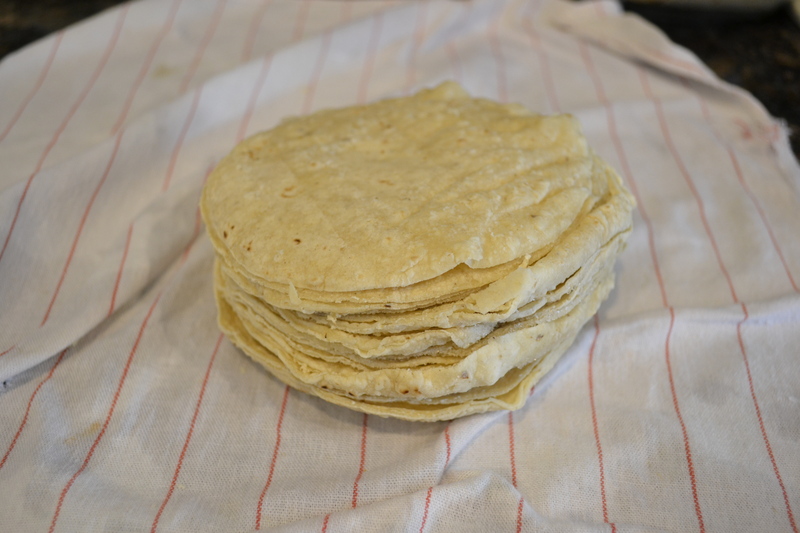 In Texas, we are lucky enough to have cook-yourself flour tortillas available in local grocers in the refrigerated section, near biscuits and pie crusts. They’re worth their weight in gold. Once you’ve had them, you’ll never go back. They even freeze!!! My dear Deerslayer surprised me with a professional-sized griddle to take on our Wyoming trip. It’ll fit on the Camp Chef propane cooktops. I can cook about 10 tortillas at a time, or toast as many buns, or heat up thick-cut bacon that I cooked at home, or make about 15 pancakes at once. That man knows what I like! He also gave me a beautiful string of pearls for those times that I feel like Julia Child! Guys, learn! Girls, weep! He’s mine! I’ve gotta say that, without sounding irreverent, fajitas are only as good as the tortillas and toppings that you put on them. 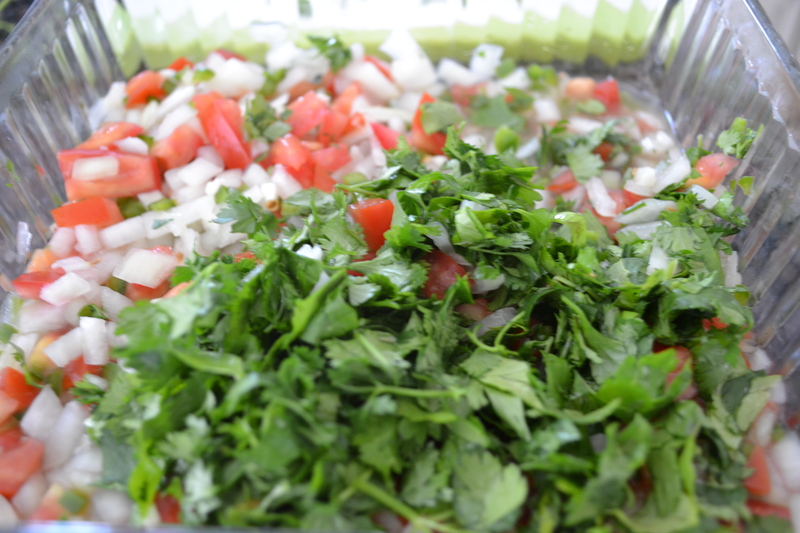 When I say toppings, you need to know that there’s really only one acceptable topping for this meat of kings in the Deerslayer domain; and that topping is Pico de Gallo (the beak of the rooster). My deerslayer uses the recipe that he learned from his father. The bright, fresh veggies, accented with garlic, vinegar, and oil compliment the meat perfectly. Here it is, but only with permission! I’m not sure how “authentic” it is, but it is truly from the Deerslayer Clan. 1. 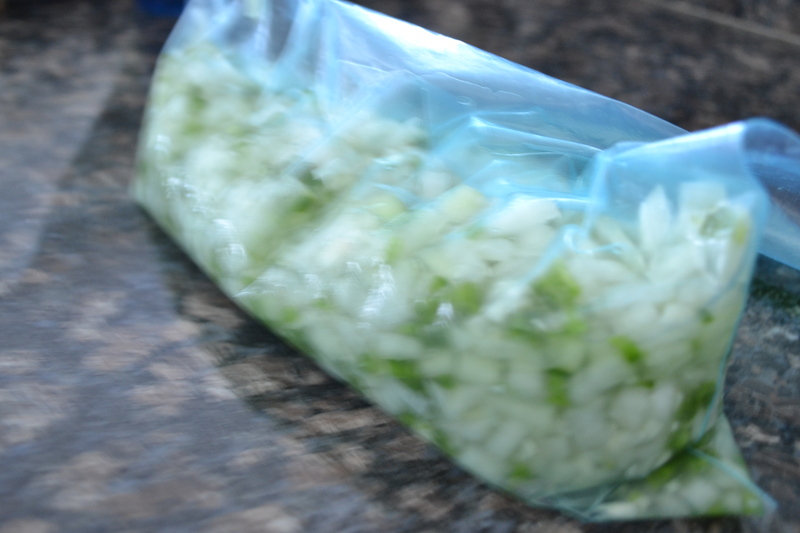 Add chopped onion, jalapenos, garlic in a one-gallon zip bag. Add enough apple-cider vinegar to cover. Allow to macerate for at least a couple of hours. 2. Transfer to a glass serving dish. Add tomatoes, salt & pepper, cilantro, and avocado. 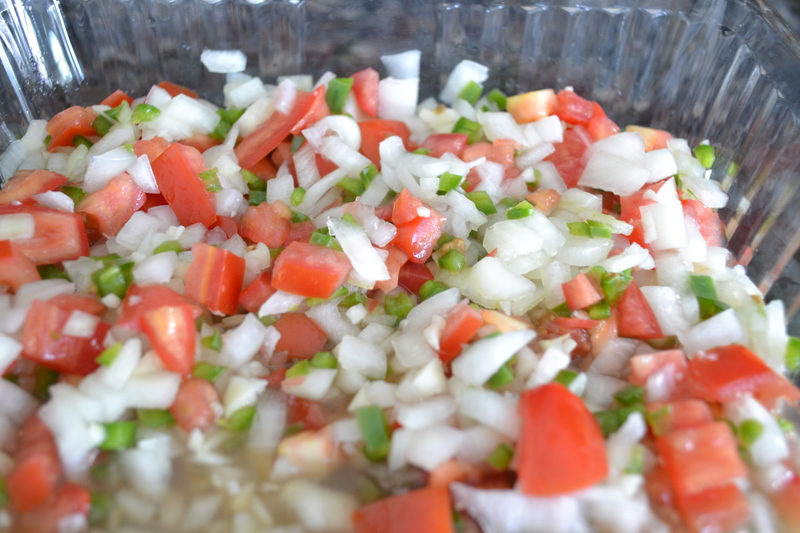 Toss with a splash of oil and serve with tortilla chips, homemade if at all possible. 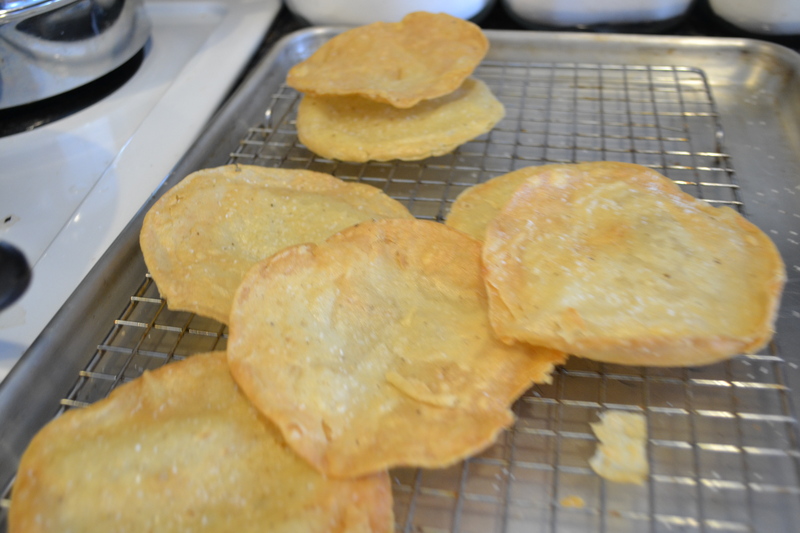 There’s nothing like homemade corn tortilla chips! Soooo worth the effort! 3. 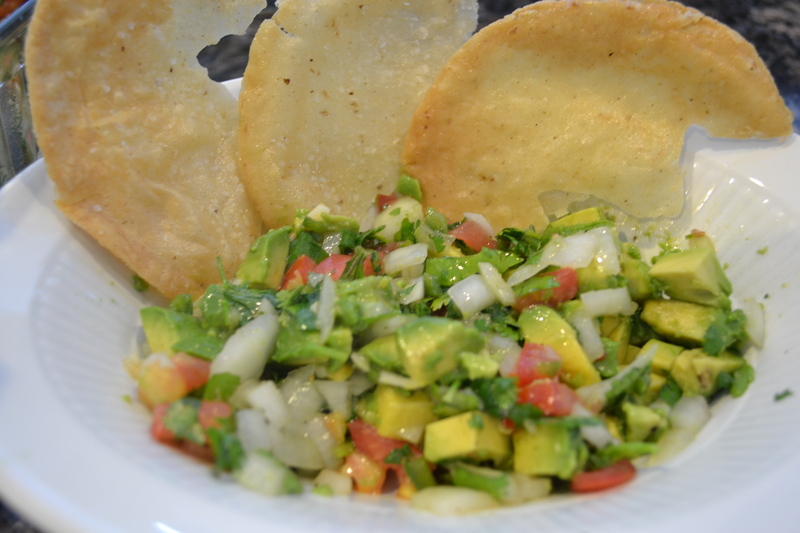 Start with corn tortillas from the store. They don’t need to be fresh. As a matter of fact, I always toss leftover tortillas into the freezer and save for a batch of tortilla chips. 4. Add about an inch of cooking oil to a deep-sided cast iron dutch oven. Heat to medium high heat. 5. Be sure that tortillas are dry. Prepare one tortilla at a time. 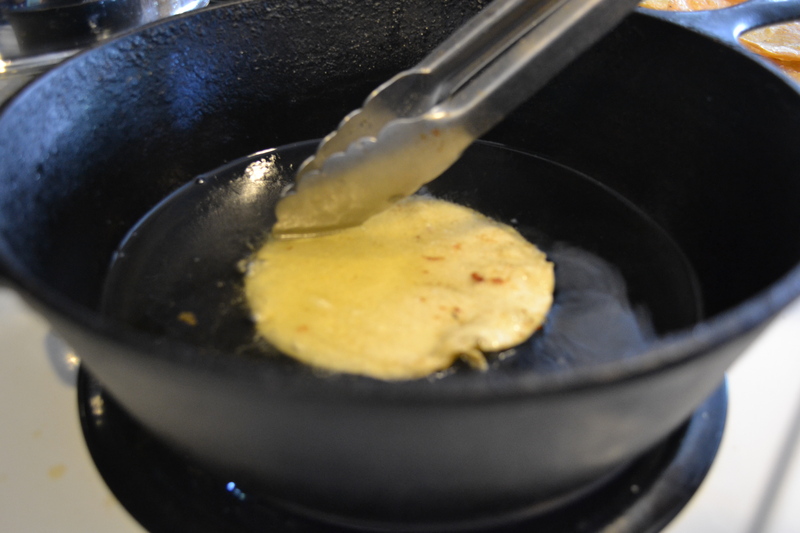 Using tongs, add tortilla to hot oil. Allow to fry for a couple of minutes until crispy. 6. Set on a cooling rack atop a cookie sheet. Immediately sprinkle with kosher salt. Well done. 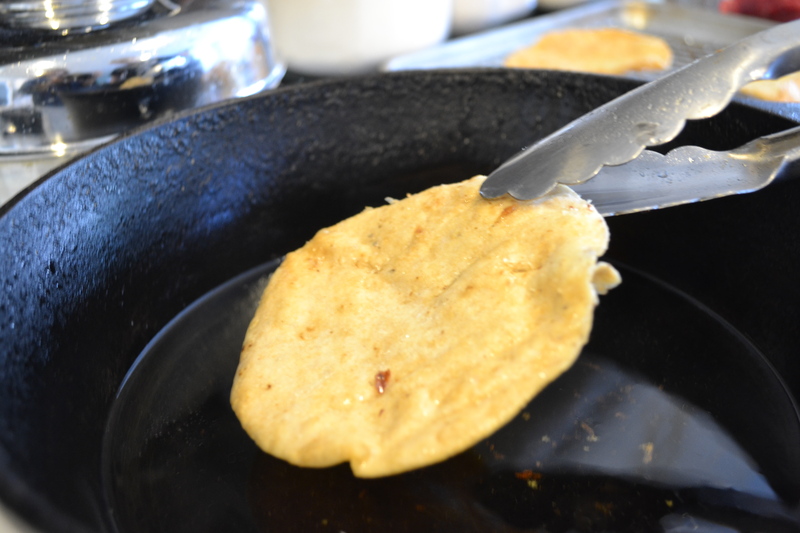 Most people don’t cook tortillas properly. its a food sin! I have to agree! There should be some sort of “Confession” for use of less-than-adequate tortilla chips. Thanks for visiting the Deerslayer’s Wife. I’m really looking forward to it! My junior deerslayer is baking fresh baguettes for the trip. Ahh, this is roughing it in the best possible way!